GET READY FOR THE LEARN FUN! Do you wish to explore a career in the vibrant world of CINEMA and TELEVISION? Are you passionate about our amazing Heritage & Archaeological treasures? Are you passionate about filmmaking, photography, editing or screenwriting? Do you wish to learn the INS and OUTS of filmmaking right from pre-production to post-production? 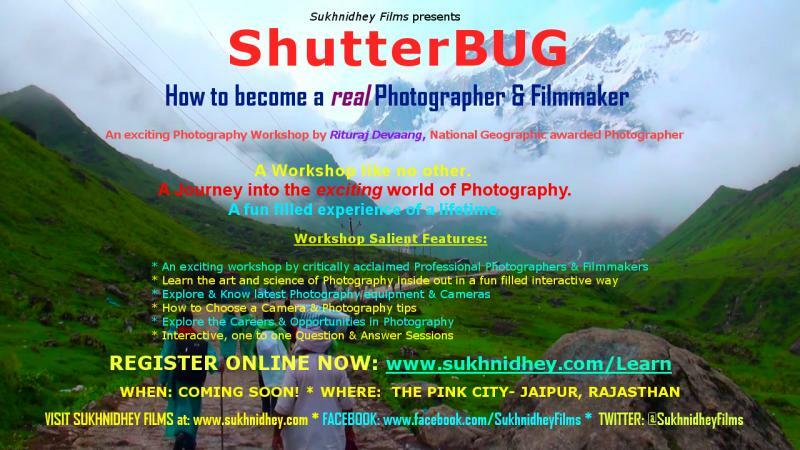 Sukhnidhey Films﻿ now brings you exciting WORKSHOPS/SHORT COURSES (Over the weekends; very nominal fees) which would acquaint you with ALL YOU NEED TO KNOW TO quickly KICK-START YOUR CAREER IN Archaeo-FILMMAKING! Find on this page the details of the upcoming workshops, trainings, seminars, courses, etc to be organized by Sukhnidhey Films in the near future. Note: You are strongly advised to register for both days for a thorugh understanding and a richer experience. However, the sessiions on the two days are designed to be independent, so if you're short of time, you might choose to attend one of the days and dive into the world of photography & filmmaking! STEP 3: You will receive an SMS from us with your Code no. You are then successfully registered! LEARN FROM HIGHLY AWARDED FILMMAKERS! A CHANCE TO JOIN US ON OUR FILMS! Would provide students with a golden chance to exhibit their skills and passion before our team, which could also lead us to handpick talented individuals to be a part of our upcoming projects and films. ACQUIRE IN DEPTH KNOWLEDGE & MASTER THE ART!! VISIT FIELD SHOOTS & REAL PRODUCTION STUDIOS!! GIVE BACK TO THE SOCIETY! One of the primary aims of our workshops is to raise mass awareness on the conservation and preservation on our rich natural and cultural heritage; we aim to help create a new generation of filmmakers who are sensitized towards conservation. ARE YOU A BEGINNER? KICK START YOUR CAREER! For beginning filmmakers just starting out, several workshops on “How to begin with Films”, and “Introduction to Filmmaking” would prove to be a perfect start with information on the right equipment to buy, the right software, the required skillset, etc. ARE YOU A PROFESSIONAL? BRUSH UP YOUR SKILLS! For more advanced filmmakers, we have workshops covering the more advanced topics of filmmaking, such as on digging deeper into “Non-Linear Editing”, “Film Continuity”, “Advanced studies on Composition and Spaces”, etc. Please fill this form to register yourself for latest updates on the upcoming workshops and trainings by Sukhnidhey Films, and we would get in touch with you shortly. We would announce the updates on new workshops and courses as and when they are organized; PLEASE CONTINUE WATCHING THIS SPACE. or, visit our CONTACT US page and let us know how we could be of help to you. Any Queries in filling this form? YOUR INFO IS COMPLETELY SAFE WITH US.